The price of Bitcoin will surely continue to fall on the news that all Chinese Bitcoin exchanges will close by the end of September 2017. Here at The Finance Guy, we wanted to share an opportunity to trade on the price of Bitcoin falling. We found a CFD provider called plus500, who offer contracts on Bitcoin and a collection of other cryptocurrencies. 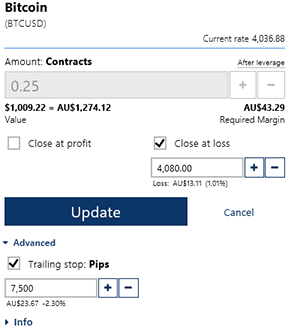 We opened an account, from Australia, and added $150 to try our luck at short selling Bitcoin. Yesterday, we decided to trade the falling price of Bitcoin. We opened a short position, which means we sold Bitcoin. The price kept falling, and our trade turned from red (loss), to green (profit). Because of the leveraged exposure, our return on deposit was magnified. As the price of Bitcoin kept falling, the profit on our short trade grew. Plus500 allows us to trade on our unsettled balances. This means that as our trade became more profitable, we had more and more funds available to trade again. A couple of hours after this the price did start to recover so the trades all closed Unfortunately they weren't quite as profitable as in the screen shot, but still made just under $75 using only $150 of our own funds on deposit. 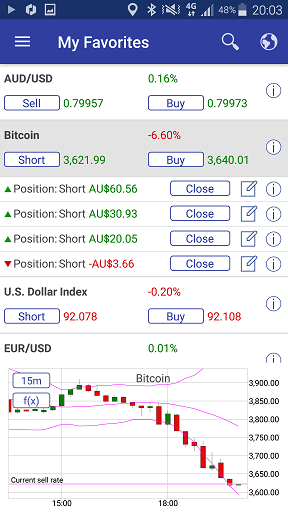 Today we continued to short Bitcoin as shown from the below screenshot from the plus500 web app. Plus500AU Pty Ltd (ACN 153301681), licensed by: ASIC in Australia, AFSL #417727, FMA in New Zealand, FSP #486026; Authorised Financial Services Provider in South Africa, FSP #47546. You do not own or have any rights to the underlying assets. Please refer to the Disclosure documents available on the website. At the peak of our Bitcoin Cash trading, we had turned our $100 into over $500. Unfortunately we did not close our trades at the peak. The price of Bitcoin cash turned and the upward market turned volatile. Our trades automatically closed because we had placed trailing stop orders on them. A trailing stop order allows you to automatically close your trades if the market moves against you by a certain amount. Plus500 suggests the size of your trailing stops, but you can adjust them yourself. We are hoping the price of Bitcoin will drop further and give us more gains, but if we are wrong and the price goes back up to $4,080, then our trade will close at a profit of $13.11. We will make a profit of 30.28% if the market moves against us. As well as the stop loss, which sets the worst case outcome, we have also set a trailing stop of 7,500 points or $75. Our trade is for 0.25 Bitcoin, so this represents a change of $23.67 on our deposit. At this time the original stop loss will close our trade before the trailing stop. If luck is on our side, and the price continues to fall, then the trailing stop will follow it down. The $75 stop is set by the lowest price Bitcoin reaches while the trade is active. The automatic closing price will drop if the price of Bitcoin keeps falling. Using stops means that we do not need to spend all our time watching trading screens. This trade might close at a profit of 30.28%, or it might follow the market for even better returns. From this point we don't have to do anything.